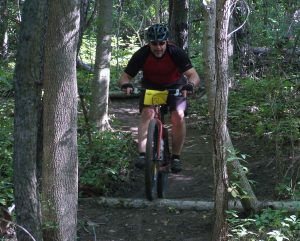 The Mountain bike trail is 7 miles or more of minimally groomed tight winding single-track. The official trailhead is located at the tennis courts parking lot near the park entrance; this is where the trail starts and ends. This trail was designed for the off-road cyclist but also serves as a local training trail for runners and recreational hikers. The south side of the park has approximately 3.5 miles with a few technical sections for the more advanced user. The north side of the park (after you go under US 30) is another 3.5 miles. The north side is a bit more difficult providing the user with a more aerobic workout. 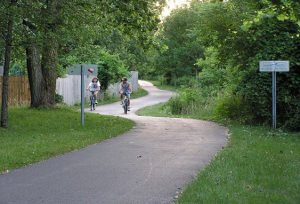 For the cyclist, the trail provides a great opportunity to hone their bike handling skills as there are some really tight turns and pretty risky but fun technical sections. Along the route the user will experience several short power climbs, small bumps and challenging terrain. One may also encounter some of the wildlife in the park. All of this can be accessed at several points in the park. Whether hiking, running or biking, the trail gives the user a vacation from our busy lives (even if it’s only for an hour). The Blue River Trail currently begins at Whitley Street next to the Fire Museum, continues past the YMCA and on into Morsches Park. The total length of the trial is approximately 4.6 miles if you begin at Whitley Street, travel around the pond at Morsches Park, and head back to Whitley Street. The expansion was completed spring 2013. It was expanded from Morsches Park to DeMoney & Grimes Funeral home which added .8 miles to the current trails. There is a new bridge added over the Blue River and all the steel was donated by Steel Dynamics Industry.